Oh, man, this is a really beautiful loading screen. Indeed, I think this game has the best loading screen of all entries we have received so far. But let’s not be distracted by gratuitous bells and whistles. Let’s head for the game itself. What we have here is possibly the worst nightmare for most children. And I’ve felt weird, because I remember how, as a child, my dad talked me about educational videogames (ain’t such a concept such an antithesis?) 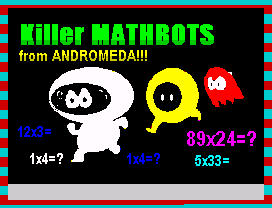 in which you had to answer to mathematical questions everytime you lost the game… And this game is just about that. There’s two mad characters which will chase our hero relentlessly. Not only they will pursue him continuously, but he doesn’t have anywhere to hide. So do your best on making him last as much as possible, ’cause if they trap (either of them) him, you will be facing one of the hardest punishments you can imagine: a math test you won’t be able to finish until you give a proper, correct answer. Scary, innit? O, P, Q, A: escape!